I've been busy scouring alpaca fleece the last couple of weeks, courtesy of Lonesome Oak Alpaca, I have some beautiful fiber to process. When time and space permit, I zip out out to the garage to sort or down to the laundry room and scour another two-three batches and fluff them out to dry on screens. 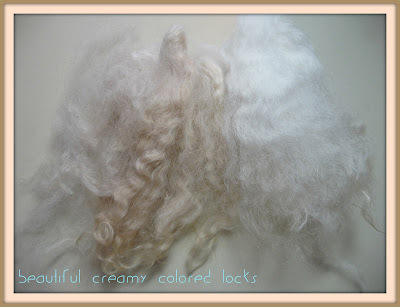 The fiber is so gorgeous, I can hardly keep my hands off of it! I'm always finding an excuse to fuss around with it as it dries, sorting it, examining it, fluffing it up some more! The fiber pictured above was so pretty, that I had planned on spinning it as is...buuut then I was dyeing a hank of yarn and I thought...geez, why fire up the dye pot for just one hank of yarn. ( You see how I rationalize) So I scooped up the first batch of Sassy's fiber that I had scoured, about an ounce and got it ready to go in the pot. 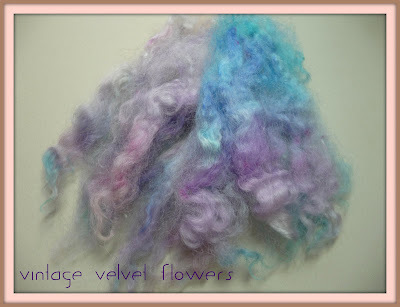 I applied the dye with a gentle hand, allowing the beautiful natural color to shine through.The effect was lovely, it reminds me of vintage velvet flowers, soft, and faded in some places, brighter in others, I was so pleased with how it turned out that I will be dyeing up some more of Sassy's fiber to add to the pot! I'm quite excited to spin this, of course I can hardly wait to spin everything I get my hands on! WOW your vintage velvet flowers are georgous. The first picture blew me away. I was playing a game while waiting for your blog to load and I see this ANGLE of Jesus appear on the side. Sure hope it is a good sign. Alpaca is very hard to leave alone when being right near by.